Microsoft has gone nuts about books. Most people don’t realize it but Microsoft Press is a major book publisher and is continually putting out how-to books. They’re pretty good. The group we like the best is their “Step By Step” series. A new set just came out covering the parts of Office 2010. These are chock-full, as they say, of tips and tricks. For instance, in “Word 2010, Step by Step,” you can learn that the new version not only lets you insert photos and other graphics into your Word documents, but you edit them there as well. Translation tools make it easier to collaborate with people in other countries. Preview what any pasted text or graphic will look like before you do it and choose from among several formats. 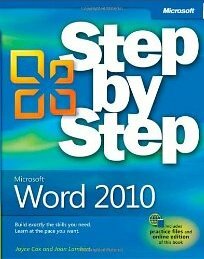 The set of five Step By Step books are $30 each from Microsoft Press, but we noticed they’re only $20 at Amazon.com. The books are heavily illustrated and great learning tools. If you’d rather have an overview, we just saw and really liked “Plain & Simple, Microsoft Office 2010.” This covers the whole show and is lavishly illustrated in color. The huge advantage of illustrations is being able to see what your screen should look like after you followed the instructions.